Wonderful jacket with many pretty details from ROCO BAROCO. 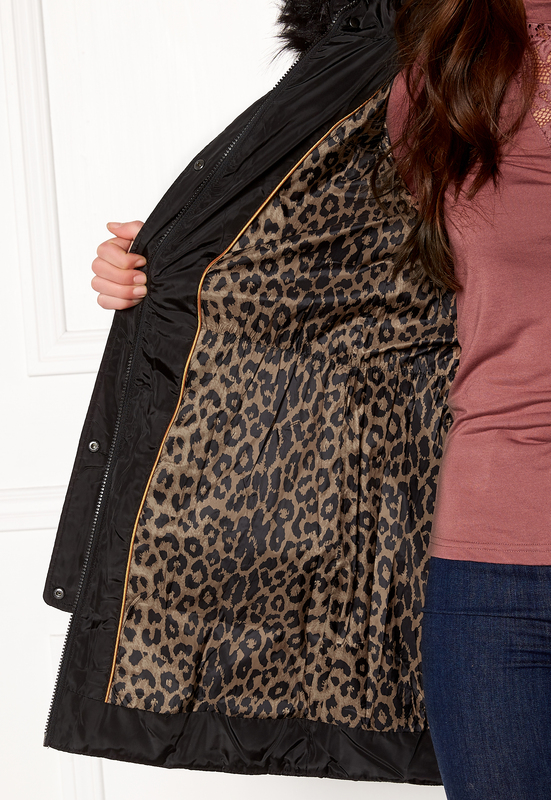 The jacket has a lovely, removable faux fur, as well as a warm Sorona filling. Sorona is a synthetic down from DuPont that has many good and warming qualities. - Figure-hugging fit - Double closure at the front with a zip and buttons - Hood with a drawstring and removable faux fur - Three front pockets with zips - One pocket on the left sleeve - One inner pocket - Cuff and zip at the wrists - Pretty leopard print lining Back length from shoulder 84 cm, bust 88 cm, sleeve length 66 cm, in size 36. The model is 175 cm tall and wears a size 36. Dry-cleaning only.